This article is about the research university. For other uses, see University of Houston (disambiguation). The University of Houston (UH) is a state research university and the main institution of the University of Houston System. Founded in 1927, UH is the third-largest university in Texas with over 46,000 students. Its campus spans 667 acres in southeast Houston, and was known as University of Houston–University Park from 1983 to 1991. The Carnegie Foundation classifies UH as a doctoral degree-granting institution with "highest research activity." The U.S. News & World Report ranks the university No. 171 in its National University Rankings, and No. 91 among top public universities. The university offers more than 282 degree programs through its 14 academic colleges on campus—including programs leading to professional degrees in architecture, law, optometry, and pharmacy. The institution conducts $150 million annually in research, and operates more than 40 research centers and institutes on campus. Interdisciplinary research includes superconductivity, space commercialization and exploration, biomedical sciences and engineering, energy and natural resources, and artificial intelligence. Awarding more than 9,000 degrees annually, UH's alumni base exceeds 260,000. The economic impact of the university contributes over $3 billion annually to the Texas economy, while generating about 24,000 jobs. The University of Houston hosts a variety of theatrical performances, concerts, lectures, and events. It has more than 400 student organizations and 17 intercollegiate sports teams. Annual UH events and traditions include The Cat's Back, Homecoming, and Frontier Fiesta. 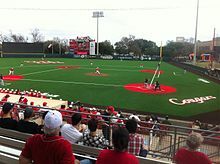 The university's varsity athletic teams, known as the Houston Cougars, are members of the American Athletic Conference and compete in the NCAA Division I in all sports. The football team regularly makes bowl game appearances, and the men's basketball team has made 20 appearances in the NCAA Division I Tournament—including five Final Four appearances. The men's golf team has won 16 national championships—the most in NCAA history. The University of Houston began as Houston Junior College (HJC). On March 7, 1927, trustees of the Houston Independent School District (HISD) Board of Education unanimously passed a resolution that authorized the founding and operating of a junior college. The junior college was operated and administered by HISD. Originally HJC was located in San Jacinto High School and offered only night courses. Its first session began March 7, 1927, with an enrollment of 232 students and 12 faculty. This session was held primarily to educate the future teachers of the junior college; freshmen were not permitted to enroll. A more accurate date for the official opening of HJC is September 19, 1927, when enrollment was opened to all persons having completed the necessary educational requirements. The first president of HJC was Edison Ellsworth Oberholtzer, who was the dominant force in establishing the junior college. The junior college became eligible to become a university in October 1933 when the Governor of Texas, Miriam A. Ferguson, signed House Bill 194 into law. On April 30, 1934, HISD's Board of Education adopted a resolution to make the school a four-year institution, and Houston Junior College changed its name to the University of Houston. UH's first session as a four-year institution began June 4, 1934, at San Jacinto High School with an enrollment of 682. In 1934, the first campus of the University of Houston was established at the Second Baptist Church at Milam and McGowen. The next fall, the campus was moved to the South Main Baptist Church on Main Street—between Richmond Avenue and Eagle Street—where it stayed for the next five years. In May 1935, the institution as a university held its first commencement at Miller Outdoor Theatre. In 1936, heirs of philanthropists J. J. Settegast and Ben Taub donated 110 acres (0.45 km2) to the university for use as a permanent location. At this time, there was no road that led to the land tract, but in 1937, the city added Saint Bernard Street, which was later renamed to Cullen Boulevard. It would become a major thoroughfare of the campus. As a project of the National Youth Administration, workers were paid fifty cents an hour to clear the land. In 1938, Hugh Roy Cullen donated $335,000 (equivalent to $5,962,683.22 in 2018) for the first building to be built at the location. The Roy Gustav Cullen Memorial Building was dedicated on June 4, 1939, and classes began the next day. The first full semester of classes began officially on Wednesday, September 20, 1939. On March 12, 1945, Senate Bill 207 was signed into law, removing the control of the University of Houston from HISD and placing it into the hands of a board of regents. In 1945, the university—which had grown too large and complex for the Houston school board to administer—became a private university. In March 1947, the regents authorized creation of a law school at the university. In 1949, the M.D. Anderson Foundation made a $1.5 million gift to UH for the construction of a dedicated library building on the campus. By 1950, the educational plant at UH consisted of 12 permanent buildings. Enrollment was more than 14,000 with a full-time faculty of more than 300. KUHF, the university radio station, signed on in November. By 1951, UH had achieved the feat of being the second-largest university in the State of Texas. In 1953, the university established KUHT—the first educational television station in the nation—after the four-year-long Federal Communications Commission's television licensing freeze ended. During this period, however, the university as a private institution was facing financial troubles. Tuition failed to cover rising costs, and in turn, tuition increases caused a drop in enrollment. As the University of Houston celebrated its 50th anniversary, the Texas Legislature formally established the University of Houston System in 1977. Philip G. Hoffman resigned from his position as president of UH and became the first chancellor of the University of Houston System. The University of Houston became the oldest and largest member institution in the UH System with nearly 30,000 students. On April 26, 1983, the university appended its official name to University of Houston–University Park; however, the name was changed back to University of Houston on August 26, 1991. This name change was an effort by the UH System to give its flagship institution a distinctive name that would eliminate confusion with the University of Houston–Downtown (UHD), which is a separate and distinct degree-granting institution that is not part of the University of Houston. In 1997, the administrations of the UH System and the University of Houston were combined under a single chief executive officer, with the dual title of Chancellor of the UH System and President of the University of Houston. Arthur K. Smith became the first person to hold the combined position. Since 1997, the University of Houston System Administration has been located on campus in the Ezekiel W. Cullen Building. In January 2011, the University of Houston was classified by the Carnegie Foundation for the Advancement of Teaching as a research university with very high research activity. The campus of the University of Houston is located in "southeast" (just SE of downtown) Houston, with an official address of 4800 Calhoun Road. It was known as University of Houston–University Park from 1983 to 1991. The campus spans 667 acres (2.70 km2) and is roughly bisected by Cullen Boulevard—a thoroughfare that has become synonymous with the university. The university campus includes numerous green spaces, fountains, and sculptures, including a work by famed sculptor Jim Sanborn. Renowned architects César Pelli and Philip Johnson have designed buildings on the UH campus. Recent campus beautification projects have garnered awards from the Keep Houston Beautiful group for improvements made to the Cullen Boulevard corridor. The University of Houston (UH) is the flagship institution of the University of Houston System (UHS). It is a multi-campus university with a branch campus located in Sugar Land. The University of Houston–Clear Lake (UHCL), the University of Houston–Downtown (UHD), and the University of Houston–Victoria (UHV) are separate universities; they are not branch campuses of UH. The University of Houston's campus framework has identified the following five core areas and districts: inner campus, the Arts District, the Professional District, the Wheeler District, and the Stadium District. In addition, the campus contains several outlying areas not identified among the four districts. The inner campus contains the academic core of the university and consists of the M.D. Anderson Library, the College of Liberal Arts and Social Sciences, the College of Natural Sciences and Mathematics including the Physics Department, the College of Technology, and the Honors College. The interior of the campus has the original buildings: the Roy G. Cullen Building, the Old Science Building, and the Ezekiel W. Cullen Building. Academic and research facilities include the Cullen Performance Hall, the Science and Engineering Research and Classroom Complex, and Texas Center for Superconductivity, and various other science and liberal arts buildings. This area of campus features the reflecting pool at Cullen Family Plaza, the Lynn Eusan Park, and various plazas and green spaces. The Arts District is located in the northern part of campus and is home to the university's School of Art, the Moores School of Music, the School of Theatre and Dance, the Gerald D. Hines College of Architecture, and the Valenti School of Communication. The district also has the Cynthia Woods Mitchell Center for the Performing Arts which houses the Lyndall Finley Wortham Theatre, the main stage of the School of Theatre and Dance, and Moores Opera Center. Other facilities include the Dudley Recital Hall and the Organ Recital Hall in the Fine Arts Building, the Quintero Lab Theatre in the School of Theatre and Dance, and the Moores Opera House and Choral Recital Hall in the Moores School of Music Building. The Wheeler District is located in the southern portion of the campus, along Wheeler Avenue and east of Cullen Boulevard. This area has undergraduate dormitories, the Conrad N. Hilton College of Hotel and Restaurant Management, and the College of Optometry. Dormitory facilities include the twin 18-story Moody Towers, Cougar Village, and the Quadrangle which has the following five separate halls: Oberholtzer, Bates, Taub, Settegast, and Law. Adjacent to the Moody Towers and Lynn Eusan Park is the Hilton University of Houston Hotel. The University of Houston Libraries is the library system of the university. It consists of the M.D. Anderson Library and three branch libraries: the Music Library, the Weston A. Pettey Optometry Library, and the William R. Jenkins Architecture and Art Library. In addition to the libraries administered by the UH Libraries, the university also has the O'Quinn Law Library and the Conrad N. Hilton Library. The 264,000 ft² (25,000 m²) Campus Recreation and Wellness Center, which is home to the nation's largest collegiate natatorium, was recognized by the National Intramural-Sports Association as an outstanding facility upon its completion in 2004. The 200,000 sq ft (19,000 m2) Science and Engineering Research and Classroom Complex (SERCC) was designed by architect César Pelli. It houses facilities for many interdisciplinary research programs at UH, including bionanotechnology. The University of Houston operates a 250-acre branch campus in Sugar Land. The campus was founded in 1995 as a higher education "teaching center" of the University of Houston System. The branch campus has two buildings: the Albert and Mamie George Building and Brazos Hall. The University of Houston (UH) is one of four separate and distinct institutions in the University of Houston System, and was known as University of Houston–University Park from 1983 to 1991. The University of Houston (UH) is the flagship institution of the University of Houston System (UHS). It is a multi-campus university with a branch campus located in Sugar Land. The University of Houston–Clear Lake (UHCL), the University of Houston–Downtown (UHD), and the University of Houston–Victoria (UHV) are stand-alone universities; they are not branch campuses of UH. The organization and control of the University of Houston is vested in the Board of Regents of the University of Houston System. The board has all the rights, powers, and duties that it has with respect to the organization and control of other institutions in the System; however, UH is maintained as a separate and distinct institution. The president is the chief executive officer (CEO) of the University of Houston, and serves concurrently as chancellor of the University of Houston System. The chancellor is the CEO of the UH System, and the position is appointed by its board of regents. As of January 2008, Renu Khator has been president of the University of Houston and chancellor of the UH System. The administrations of the University of Houston and the UH System are located on the university campus in the Ezekiel W. Cullen Building. The Chancellor/President resides in the Wortham House, provided by the Board of Regents of the University of Houston System as part of the chancellor/president's employment contract. The university offers 282 degree programs. With final approval of a Ph.D. in Communication Sciences and Disorders, a Doctorate in Nursing Practice, and a Doctorate in Medicine, the University will offer 51 doctoral degrees including three professional doctorate degrees in law, optometry, and pharmacy. Awarding more than 9,000 degrees annually, UH's alumni base exceeds 260,000 and is the largest in the Houston area. UH is one of four public universities in Texas with a Phi Beta Kappa chapter. The University of Houston's faculty includes three-time Pulitzer Prize winner Edward Albee, National Medal of Science recipient Paul Chu from the Physics Department, and Nobel Peace Prize Laureate Jody Williams. The College of Liberal Arts and Social Sciences has the Creative Writing Program, which was founded by alumnus Donald Barthelme and offers degrees in poetry, fiction, and non-fiction. The Gerald D. Hines College of Architecture is one of only 36 schools to have an accreditation from the National Architectural Accrediting Board. In August 2016, the Texas Higher Education Coordinating Board approved the creation of the Hobby School of Public Affairs. The school, named in honor of former Texas Lt. Gov. Bill Hobby, builds on the existing educational and research programs of the Center for Public Policy, which was founded at UH in 1981. The designation officially moves the Master of Public Policy Degree from the UH College of Liberal Arts and Social Sciences to the Hobby School of Public Affairs and approves the addition of a Master of Public Policy degree as a dual degree with the Graduate College of Social Work’s Master of Social Work. In October 2018, the Texas Higher Education Coordinating Board approved the creation of the College of Medicine. A site has been selected for the College's new building, and the inaugural class is planned for 2020. The University of Houston was ranked the 31st top college in the United States by Payscale and CollegeNet's Social Mobility Index college rankings. The U.S. News & World Report ranks the university No. 192 in its National University Rankings, and No. 102 among top public universities. The Princeton Review has listed UH as one of America's best colleges. The institution ranks in the Top 50 American Research Universities, and is among the Top 300 in the global Academic Ranking of World Universities. The University of Houston Law Center was ranked 56th among the nation's "Best Law Schools" in U.S. News & World Report in 2012. U.S. News & World Report ranked the C.T. Bauer College of Business as the top Undergraduate Business Program in Houston, third among public universities in the state of Texas, and 43rd in the nation among public universities. In 2002, the Conrad N. Hilton College of Hotel and Restaurant Management ranked third in the nation in hospitality management by the Journal of Hospitality & Tourism Education. The Wolff Center for Entrepreneurship at the C.T. Bauer College of Business undergraduate program for Entrepreneurship consistently ranks in the top 10 in the nation. The program has been ranked by The Princeton Review and Entrepreneur magazine as No. 1 for 2008, 2010, and 2011; and No. 2 in 2007, 2009, and 2017. The Carnegie Foundation classifies the University of Houston as a doctoral degree-granting institution with "highest research activity." The designation makes UH one of only six public universities in Texas with that classification. The university conducts $150 million annually in academic and scientific research, and operates more than 40 research centers and institutes on campus. Through these facilities, UH maintains partnerships with government, health care and private industry. Areas of interdisciplinary research include nanotechnology, superconductivity, space commercialization and exploration, biomedical sciences and engineering, energy and natural resources, and artificial intelligence. The University of Houston is notable for its diverse student body, and U.S. News & World Report ranks UH as the second-most ethnically diverse research university in the United States. With more than 46,400 students in the Fall 2018 semester, the university has significant numbers of Asian American and Hispanic students. Its international student population is primarily from Asia. Located in the Fine Arts Building, Blaffer Art Museum is a contemporary art museum dedicated to emerging, mid-career, and underrepresented artists and bodies of work through exhibitions, publications, and public programs. Its educational programs include public lectures, artists' talks, docent tours, audio guides, and youth programs such as Studio Saturday, Summer Arts, and the Young Artist Apprenticeship Program. The Cullen Performance Hall is a 1,544 seat proscenium theater located near Entrance 1. The hall offers a variety of events sponsored by departments and organizations at the university in addition to contemporary music concerts, opera, modern dance, and theatrical performances put on by groups in and outside the Houston area. The School of Theatre and Dance offers a subscription series of five plays each year. Works by classical and modern dramatists, as well as new musical collaborators, are seen in full productions or "gypsy runthroughs." Fifteen percent of UH students live on campus. UH has several on campus dormitories: Moody Towers, The Quadrangle, Cougar Village I & II, Cougar Place, Calhoun Lofts, Bayou Oaks, Cullen Oaks, and Cambridge Oaks. Moody Towers, frequently just called "Moody," is one of the tallest complexes on campus and the largest area of residence halls. Each of the two towers consists of eighteen stories and together house 1,100 students. The Towers feature a newly renovated dining hall. The rooms in Moody were renovated during the summer of 2011. The Quadrangle, also known as "The Quad," is the oldest housing area on campus and consists of several coed dorm halls: Bates, Law, Oberholtzer, Settegast, and Taub. Oberholtzer Hall features a smaller, albeit cozy dining hall. The Quadrangle houses 800 students. The rooms in The Quads were renovated during the summer of 2011. Bates Hall was the temporary home to many commuter students unable to drive home due to the flooding around campus caused by Hurricane Harvey in August 2017. The Quadrangle is currently being torn down and rebuilt to have a more modern look. In August 2009, Calhoun Lofts—a new university-owned and operated residential facility aimed at graduate and professional students—opened and includes retail stores, lecture halls, and recreation facilities. Cougar Village I & II are new freshman/Honors College dorm which opened in August 2010 and August 2013, respectively. The dormitory features themed floors with kitchens and lounges, a tutoring center, computer labs, multi-purpose rooms, study areas, a convenience store, a laundry facility, and a fitness center. Cougar Village I & II are exclusive only to freshman and Honors College students. In addition to traditional dormitories, Cougar Place was an apartment-style housing complex consisting of 400 units. Cougar Place has since been demolished as of 2013[update] and has been replaced with a new on-campus housing complex for sophomores. The official student newspaper is The Cougar, formerly The Daily Cougar, and has been published since 1927. Students also produce the Houstonian magazine, which acts as a yearbook; Cooglife, a monthly lifestyle magazine; and Transitions, a magazine for freshmen and transfer students. The UH Student Video Network, known as CoogTV, is a live student-run TV network that appears on the University of Houston cable network. The Frontiersmen - initially exclusive to members of the Sigma Chi Fraternity, but later opened membership to the entire student body - is a group of students who participate in university events to drive school spirit. At football games, the Frontiersmen—donning cowboy hats, Wrangler Jeans, and dusters for attire—run across the field with the university's flag and the Flag of Texas after each score. Frontier Fiesta—a re-creation of a 19th-century Western town, with music, food and historical exhibits—is a major event on campus each spring semester. The student-led festival is a part of a long-standing tradition dating back to the 1940s established by Gan Bey which later became the Sigma Chi Fraternity's Epsilon Xi chapter at UH. Frontier Fiesta attained widespread notoriety when the Sigma Chi variety show performance known as "Bella Union" garnered national attention on the cover of Life (magazine) as "The Greatest College Show on Earth" and soon-after drew crowds numbered in the tens of thousands from all across the country to participate in the festivities. As Frontier Fiesta grew it eventually evolved into what we know today as the Houston Livestock Show and Rodeo. Although, there is still an annual "Frontier Fiesta" held on UH's campus - the Houston Rodeo is today's closest resemblance to the original Frontier Fiesta. The BLAZE is an oil field warning siren that was chosen to represent the university's ties to the petroleum industry. The purchase of the siren was completed in 1991. The Sigma Chi Fraternity has been in charge of the siren and gave it the name "The BLAZE" in honor of its fallen brother, David Blazek. Cougar First Impressions—a program headed by the UH Staff Council—takes place every year on the first two days of classes, when faculty and staff turn out to welcome new and returning students. The University of Houston and the University of Texas played their first football game against one another in 1953. Since this was their first meeting, members of Alpha Phi Omega—the service fraternity in charge of taking care of Shasta I, the university's mascot—brought her to the game. During the trip, Shasta's front paw was caught in the cage door and one toe was cut off. At the game, several Longhorn players saw what had happened and began taunting UH players by holding up their hands with the ring finger bent, suggesting the Cougars were invalids. Texas went on to win this game 28–7. UH students had been using the victory sign as a hand signal up to that time, but began using the bent-finger sign as a reminder that they would remember the taunts. The Cougars didn't play the Longhorns again until 1968. With UH fans holding up the new sign of Cougar pride, UH played UT to a 20–20 tie. They didn't meet again until 1976, the first year UH was a member of the Southwest Conference. In front of a record crowd at Texas' Memorial Stadium, UH defeated UT 30–0, a rout that signaled the beginning of the end for legendary Texas coach Darrell Royal. This solidified the use of the Cougar Paw as a tradition. UH's 17-sport intercollegiate program is a member of the American Athletic Conference. Houston was previously a member of Conference USA, of which it was a member from the time the conference was formed in 1995 until 2013. During that timespan, the Cougars won 33 C-USA titles. Prior to 1995, Houston was a member of the Southwest Conference. After 61 years of athletics at UH, other notable achievements include 16 national titles in men's golf, 1 national title in Cross-Country, five NCAA Men's Basketball Final Four appearances, and two College World Series appearances. More than 50 Olympic athletes have attended UH, bringing home 33 medals, including 19 gold. Former Olympian and UH alumnus Leroy Burrell returned as the men's track and field head coach in 1998. In April 2014, Kelvin Sampson was named the eighth men's basketball head coach. Ronald Hughey is the current women's basketball coach. On January 1, 2019, Dana Holgorsen was named head coach of the Cougar football team. The Houston Cougars football team has made 27 post-season bowl appearances and has to its credit several Southwest Conference championships and Cotton Bowl Classic appearances, as well as the 2006 Conference USA Championship and the 2015 American Athletic Conference championship. The 1989 Heisman Trophy winner, Andre Ware, was a Cougar. The men's basketball team has made 21 NCAA Tournament appearances, with five trips to the Final Four. See also Phi Slama Jama, the Cougars teams of the early 1980s that featured NBA legends Clyde Drexler and Hakeem Olajuwon. Houston competes with other notable sports teams, such as the baseball team, which has made 21 NCAA Tournament appearances with two trips to the College World Series; the men's golf team, which has won 16 NCAA National Championships; the women's soccer team, which was rated as the top first-year women's program in the country in 1998; the swimming and diving teams, which have spawned multiple Olympians and All-Americans; the track and field team, which perennially ranks in the top 10 as an NCAA team; and the volleyball team, which had a streak of ten consecutive trips to the NCAA Tournament. Awarding more than 9,000 degrees annually, UH's alumni base exceeds 276,000. The University of Houston has seen many now notable persons pass through its halls. Dwayne Michael Carter Jr., aka Lil Wayne, is a hip-hop artist from New Orleans. Alice Sebold, a noted novelist known for Lucky and The Lovely Bones, and Matt Mullenweg, creator of WordPress (the most popular, open-source blogging platform), also attended the university. Notable athletes within the list include NFL players Wilson Whitley, Glenn Montgomery, Alfred Oglesby, Craig Veasey, Donnie Avery, David Klingler, Kevin Kolb, Billy Milner, Sebastian Vollmer, Case Keenum, and Heisman Trophy winner Andre Ware; baseball stars Doug Drabek, Michael Bourn, and Brad Lincoln; golfers Fred Couples, Billy Ray Brown, Steve Elkington, and Fuzzy Zoeller; track and field legends Carl Lewis and Leroy Burrell; NBA basketball players Hakeem "The Dream" Olajuwon, Clyde "The Glide" Drexler and "The Big E" Elvin Hayes as well as Bo Outlaw, Don Chaney, Michael Young, Damon Jones, Carl Herrera and Otis Birdsong; and legendary Dallas Cowboys coach Tom Landry. The owner of the San Diego Padres and noted philanthropist John Moores holds both undergraduate and law degrees. Wade Phillips, a former head coach of the Denver Broncos, Buffalo Bills, and Dallas Cowboys, is a UH alumnus as well. Elizabeth Warren, a U.S. Senator representing Massachusetts, a 2020 U.S. Presidential candidate, and formerly a Harvard Law School faculty member and chair of the Congressional Oversight Panel created to oversee the U.S. banking bailout during the 2008–2009 financial crisis, received her B.S. from UH in 1970. Tom DeLay, a former member and majority leader of the U.S. House of Representatives, who represented Texas's 22nd congressional district from 1984 until 2006, also attended the University of Houston. Other politicians who attended UH include Gene Green, a Democratic politician and a U.S. congressman from the state of Texas representing that state's 29th congressional district, which includes most of eastern Houston, along with large portions of Houston's eastern suburbs; and Ted Poe, a Republican politician currently representing Texas's 2nd congressional district in the United States House of Representatives. Poe's district includes most of northern Houston, as well as most of the Beaumont–Port Arthur metropolitan area. Other notable celebrity alumni include Jim Parsons, star of the television series The Big Bang Theory, Brent Spiner of Star Trek: The Next Generation, actors Robert Wuhl, Loretta Devine, Dennis Quaid, Randy Quaid, Brett Cullen, comedian Bill Hicks and former attorney and talk show host Star Jones, Project Runway contestants Chloe Dao and Laura Bennett, sportscasters Jim Nantz and Robert Flores, YouTuber Liza Koshy, and country music star Larry Gatlin. Crystle Stewart, Miss USA 2008 is a former student at the university, last attending in 2007. Jason Alkire, an artist and fashion designer, is a graduate as well. The University of Houston Alumni Association is the official alumni association of the University of Houston. Formed in 1940, it is a nonprofit organization with a Life Membership Program of over 5,000 members. The alumni association is headquartered at the University of Houston's on-campus Athletics/Alumni Center. It can be found on the web at www.houstonalumni.com. It was previously known as the "Ex-Students Association" and the "Houston Alumni Organization." ^ "University of Houston System Fall 2011 Statistical Profile". University of Houston System. Retrieved November 18, 2011. ^ "Board of Regents approves ... provost". The Daily Cougar. Archived from the original on June 24, 2013. Retrieved June 24, 2013. ^ a b c d e f g h "University of Houston: Fall 2015 Facts" (PDF). University of Houston. Archived from the original (PDF) on November 26, 2015. Retrieved November 11, 2015. ^ "Colors - University of Houston". Uh.edu. August 24, 2016. Retrieved November 24, 2016. ^ "University of Houston Administrator's Statement". University of Houston System. Archived from the original on February 2, 2011. Retrieved May 30, 2011. ^ "University of Houston: Fall 2018 Facts" (PDF). University of Houston. Archived (PDF) from the original on March 29, 2019. Retrieved April 14, 2019. ^ a b c d e Adair, Wendy (2001). The University of Houston: Our Time: Celebrating 75 Years of Learning and Leading. Donning Company Publishers. ISBN 978-1-57864-143-7. ^ a b c d "72(R) History for Senate Bill 755". Texas Legislature Online History. Texas Legislature. Retrieved March 28, 2010. ^ a b c d Bonnin, Richard. "Carnegie Foundation Gives University of Houston its Highest Classification for Research Success, Elevating UH to Tier One Status". University of Houston. Retrieved February 8, 2011. ^ a b c d "UH achieves Tier One status in research". Houston Business Journal. January 21, 2011. Retrieved July 6, 2011. ^ a b c "UH takes big step up to Tier One status". Houston Chronicle. Retrieved July 6, 2011. ^ a b "National University Rankings". U.S. News & World Report. Retrieved September 22, 2018. ^ a b "Top Public Schools: National Universities". U.S. News & World Report. Retrieved October 14, 2016. ^ a b "Inventory of Degree Programs: Bachelor Degrees" (PDF). University of Houston. Retrieved November 24, 2015. ^ a b "Inventory of Degree Programs: Master Degrees" (PDF). University of Houston. Retrieved November 24, 2015. ^ a b "Inventory of Degree Programs: Doctoral Degrees" (PDF). University of Houston. Retrieved November 24, 2015. ^ a b "Inventory of Degree Programs: Special Professional Degrees" (PDF). University of Houston. Retrieved November 24, 2015. ^ a b "University of Houston Progress Card" (PDF). University of Houston System. Retrieved October 24, 2016. ^ a b "Research Centers & Institutes". University of Houston. Archived from the original on December 13, 2007. Retrieved March 23, 2008. ^ a b c Office of Institutional Research. "Total Number of Degrees Conferred by Level: 1929–2010". University of Houston. Retrieved November 18, 2011. ^ "UH at a Glance". University of Houston. Retrieved June 1, 2011. ^ a b c d e f "University of Houston–University Park". Hand book of Texas. Texas State Historical Association. Retrieved October 16, 2007. ^ "UH Timeline". University of Houston. Archived from the original on December 18, 2007. Retrieved October 16, 2007. ^ "UH Through Time: Events". University of Houston Libraries. Retrieved October 16, 2007. ^ a b c d e f "Discover UH's Heritage & History". UH Alumni Organization. Archived from the original on November 7, 2007. Retrieved October 16, 2007. ^ "Oberholtzer, Edison, Ellsworth". Handbook of Texas. Texas State Historical Association. Retrieved April 6, 2008. ^ a b Johnston, Marguerite (1991). Houston: The Unknown City: 1836–1946. College Station, Texas: Texas A&M University Press. p. 309. ISBN 0-89096-476-9. ^ "Group of average students sparks UH creation". Houston Chronicle. April 8, 2001. Retrieved April 6, 2008. ^ "A.D. Bruce Speeches Collection, 1954–1961". Texas Archival Resources Online (TARO). University of Texas Libraries. Archived from the original on April 21, 2007. Retrieved June 25, 2007. ^ "Scholar and Administrator Selected as Sole Nominee". UH News Release. Retrieved May 11, 2007. ^ Gerber, Eric. "Renu Khator Confirmed as New University of Houston & UH System Leader". University of Houston. Retrieved November 27, 2007. ^ Vasquez, Leticia. "Art that Speaks for Itself Enlightens New Sculpture". UH Today. University of Houston. Retrieved October 12, 2007. ^ Parker, Francine. "UH Keeps Houston Beautiful". UH Today. University of Houston. Retrieved October 12, 2007. ^ Bonnin, Richard (2009). "New Energy Research Park Energizes March to Tier One". The University of Houston Magazine. Retrieved January 31, 2013. ^ Kever, Jeannie (September 7, 2012). "Energy players team up in UH research park". Houston Chronicle. Retrieved January 31, 2013. ^ "NIRSA Awards". National Intramural-Recreational Sports Association. Archived from the original on June 17, 2004. Retrieved October 12, 2007. ^ "Appreciation for KUHT, Houston Public Television". Resolution of the Board of Directors, Corporation for Public Broadcasting. May 24, 1993. Retrieved April 8, 2009. ^ Pelli Clarke Pelli Projects Archived October 16, 2007, at the Wayback Machine. Pelli Clarke Pelli Architects official site. Retrieved October 12, 2007. ^ "Wortham House". UH Through Time. University of Houston Libraries. Retrieved June 26, 2008. ^ "Phi Beta Kappa, Nation's Most Prestigious Honor Society, Establishes Chapter at UH". University of Houston. Retrieved March 30, 2016. ^ "PBK Chapter Directory". Phi Beta Kappa. Retrieved March 30, 2016. ^ "Accredited and Candidate Programs in Architecture" (PDF). National Architectural Accrediting Board. Archived from the original (PDF) on October 26, 2007. Retrieved October 12, 2007. ^ "UH Hobby School of Public Affairs Gains Official Approval". University of Houston. August 9, 2016. Retrieved August 22, 2016. ^ Tribune, The Texas; Najmabadi, Shannon (October 25, 2018). "Texas higher education board approves medical schools for University of Houston and UNT Health Science Center". The Texas Tribune. Retrieved January 29, 2019. ^ Bonnin, Richard. "UH Chosen as One of America's Best Colleges for Undergraduates". University of Houston. Retrieved March 30, 2011. ^ "2010 Top American Research Universities Report" (PDF). The Center for Measuring University Performance. Archived from the original (PDF) on January 16, 2013. Retrieved June 1, 2011. ^ "Best Law Schools 2013". U.S. News & World Report. Retrieved May 29, 2013. ^ Lillich, J.M. "Purdue tops national survey of hospitality management programs". Purdue University. Retrieved October 12, 2007. ^ "Bauer College Entrepreneurship Program Ranks No. 2 in United States". November 14, 2017. ^ "Four Texas Colleges Reach Carnegie "Tier One" Status". The Texas Tribune. February 2, 2016. Retrieved November 24, 2016. ^ "UH DOR Centers". UH Division of Research. Archived from the original on May 10, 2012. Retrieved April 26, 2012. ^ "Methodist Neurological Institute, University of Houston combine 'brain power'". Focus on ALS. Archived from the original on December 6, 2008. Retrieved April 1, 2009. ^ "UH Nanofabrication Facility". Retrieved April 26, 2012. ^ "Center for Advanced Materials". CAM. Retrieved April 26, 2012. ^ "Integrated Bio and Nano Systems". IBNS. Retrieved April 26, 2012. ^ "TiiMS". UH Engineering. Archived from the original on May 23, 2012. Retrieved April 26, 2012. ^ "University of Houston: Research Clusters". University of Houston. Archived from the original on June 21, 2011. Retrieved June 20, 2011. ^ "Best Colleges: Racial Diversity: National Universities". U.S. News & World Report. Retrieved March 27, 2010. ^ Emery, Mike (August 6, 2007). "Regents to Vote on New Parking Garage". UH Office of Internal Communications. Archived from the original on August 18, 2007. Retrieved April 7, 2008. ^ a b "Housing Areas". UH Residential Life & Housing. Archived from the original on September 8, 2007. Retrieved October 1, 2007. ^ "Student Lofts". UH Division of Student Affairs. Archived from the original on October 16, 2007. Retrieved October 1, 2007. ^ Valdez, Tiffany. "Student-run radio at the University of Houston". Coog Radio. Retrieved August 15, 2014. ^ a b "University of Houston Traditions". UH Athletics. Archived from the original on October 27, 2007. Retrieved October 16, 2007. ^ "University of Houston: UH Traditions". University of Houston. Archived from the original on March 24, 2014. Retrieved March 23, 2014. ^ "Our History & Traditions". ssl.uh.edu. ^ Stanton, Robert (March 20, 2012). "UH Cougar pride takes center stage with new mascot". Houston Chronicle. Retrieved March 23, 2014. ^ "Cougar First Impressions". UH Staff Council. Archived from the original on August 20, 2007. Retrieved October 16, 2007. ^ "University of Houston: Points of Pride". University of Houston. Retrieved November 18, 2011. ^ "Cougars Bowl Game Trivia". UH Athletics. Archived from the original on October 16, 2007. Retrieved October 12, 2007. ^ "Official CFDA Website". CFDA. May 25, 2016. Retrieved September 19, 2016. ^ Feigen, Jonathan; Wizig, Jerry (May 16, 1993). "UH Athletics at a Crossroads". Houston Chronicle. Retrieved July 16, 2009. ^ "About the University of Houston Alumni Association". University of Houston Alumni Association. Archived from the original on March 11, 2009. Retrieved July 16, 2009. Adair, Wendy & Gutiérrez, Oscar (2001). The University of Houston: Our Time: Celebrating 75 Years of Learning and Leading. The Donning Company Publishers. ISBN 1-57864-143-8. Nicholson, Patrick J (1977). In Time: An Anecdotal History of the First Fifty Years of the University of Houston. Pacesetter Press. ISBN 0-88415-371-1.